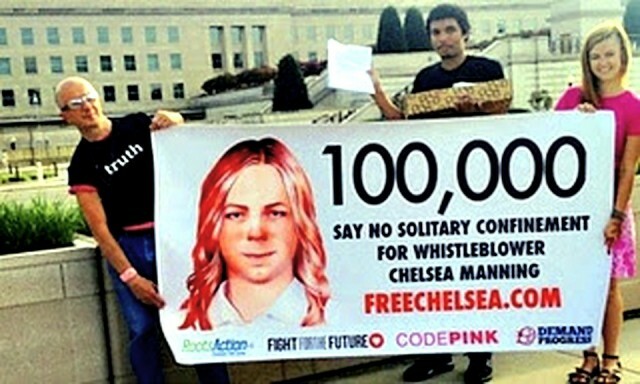 Supporters of imprisoned whistleblower Chelsea Manning held banners and delivered petitions containing 100,000 signatures to the U.S. Army’s congressional liaison office in Washington, D.C., on Aug. 18. They called on a secret panel at Kansas’ Fort Leavenworth military prison, which was meeting that day, not to sentence this courageous anti-war fighter to “indefinite solitary confinement,” as officials had threatened to do for alleged violations of regulations. The military panel found Manning guilty on all four charges. However, the mass support for Manning had an impact, as officials decided to restrict Manning’s access to the gym, library and the outdoors for 21 days, rather than carry out their original threatened punishment of solitary confinement. Manning’s attorneys were barred from attending the hearing, despite her request that it be open to the public, particularly to her legal representatives. In their continuing harassment campaign against Manning, prison authorities had charged her with ludicrous infractions, including having a tube of toothpaste past its expiration date — which was sold to her by the prison. Another charge was for “disrespecting a guard.” Manning had asked to speak to her attorney while being reprimanded about an incident in the mess hall, for which she was found guilty of disorderly conduct. Prison officials targeted Manning for having “unauthorized reading material,” which included the “U.S. 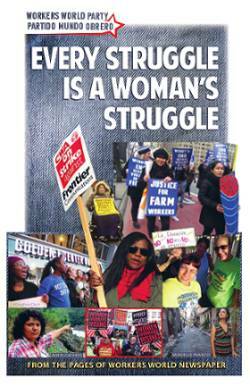 Senate Report on Torture”; lesbian, gay, bisexual and transgender publications and articles; an issue of Vanity Fair portraying Caitlyn Jenner on the cover; and a copy of Cosmopolitan containing an interview with Manning. Yet all of these materials had been delivered through the prison’s mail system. When Manning requested access to the prison library prior to the hearing to help prepare for her defense, prison officials said no. The military confinement of Army Pvt. Manning began five years ago. In a May 27 Guardian article, Manning reflects on her imprisonment and her decision in 2010 to release “the war diaries,” classified documents that revealed, as she put it, the “horrific outlook” on the U.S.-led wars in Iraq and Afghanistan, the “war on terrorism” and the “exploitation of developing countries.” Manning’s intention was to reveal the truth about these wars to the peoples of the world. For these acts, a military judge sentenced Manning on Aug. 21, 2013, to a 35-year term for violating the Espionage Act of 1917. This extremely brutal punishment has been denounced by scores of human rights, civil liberties, anti-war and legal organizations and activists. The day after the sentence was pronounced, “I finally announced my intent to change my name [from Bradley to Chelsea] and transition to living as a woman, a personal high point for me, despite my other circumstances,” says Manning. Because of Manning’s principled actions, courage and integrity — as an opponent of imperialist war and as a trans person — the military has never let up on its campaign of harassment, looking for any excuse to persecute her. Manning says what sustains her is the support from her friends, family and millions of people around the world. In that vein, she thanked her supporters for their love and support on Twitter, the day after the hearing at Fort Leavenworth and the protest in Washington.